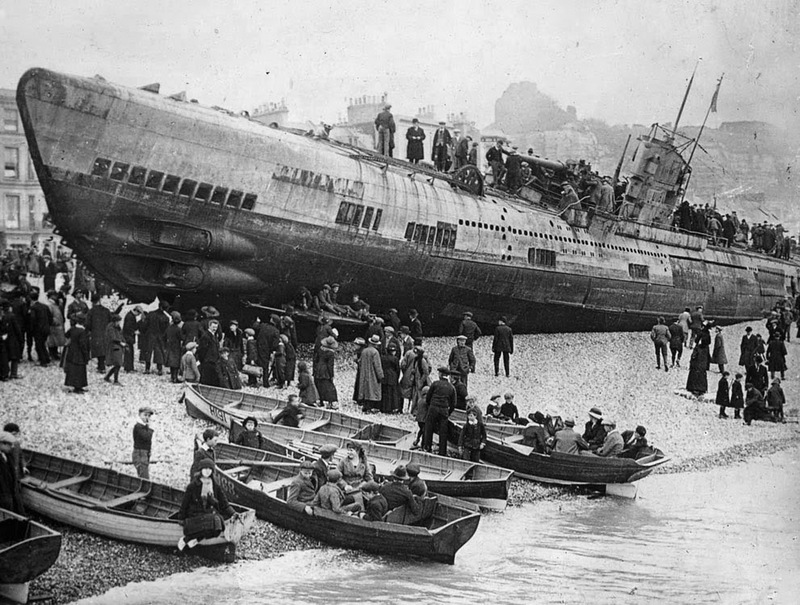 When the people of the town of Hastings awoke one morning to see one of the Kaiser’s U-boats on their beach, it caused some shock. Thousands of visitors flocked to see the beached submarine. The Admiralty allowed the town clerk to charge a fee for people to climb on the deck. Two members of the coastguard were tasked with showing important visitors around inside the submarine. The visits were curtailed when both men became severely ill, they both died shortly after. It was a mystery what killed the men at the time and so all trips into the sub were stopped, it was later discovered that chlorine gas which had been escaping from SM U-118′s batteries had caused severe abscesses on the lungs and brains of the unfortunate men. Thousands of people flocked to the seafront to catch a glimpse of the boat. Under the command of Herbert Strohwasser, U-118 managed to sink two ships while on its one and only patrol before being surrendered on February 1919. The total sum collected from the fees was almost £300 which was used in an event to welcome the town’s troops returning from the war. With the ending of hostilities on 11 November 1918 came the subsequent surrender of the Imperial German Navy, including SM U-118 to France on 23 February 1919. 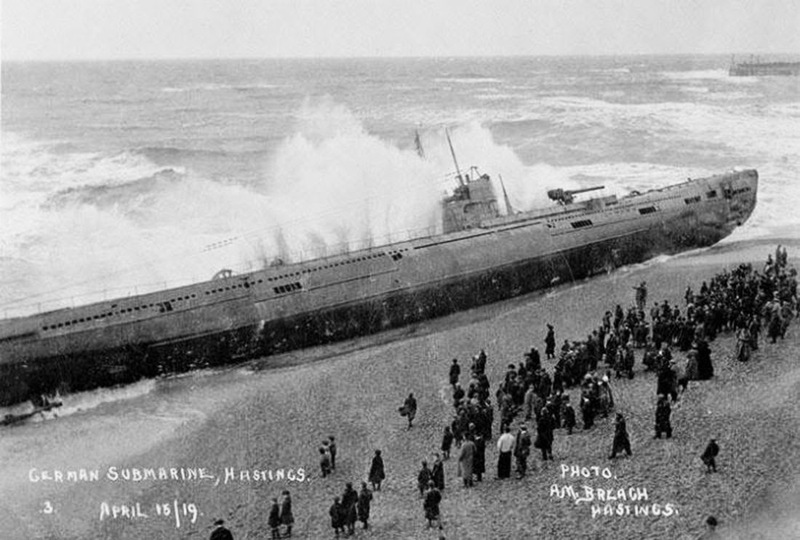 Following the surrender, U-118 was to be transferred to France where it would be broken up for scrap. However, in the early hours of 15 April 1919, while it was being towed through the English Channel towards Scapa Flow, its dragging hawser broke off in a storm. 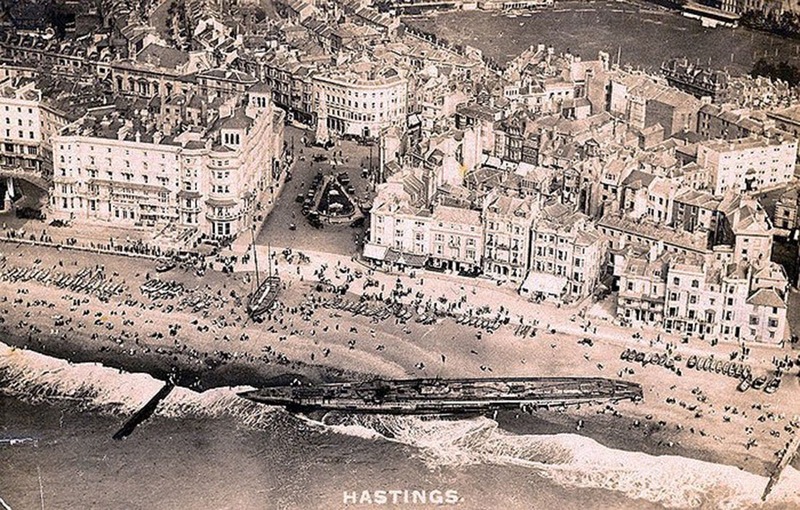 The ship ran aground on the beach at Hastings in Sussex at approximately 12:45am, directly in front of the Queens Hotel. Initially there were attempts to displace the stricken vessel; three tractors tried to refloat the submarine and a French destroyer attempted to break the ship apart using its cannons. These attempts however were unsuccessful and the proximity of the submarine to the public beach and Queens Hotel dissuaded further use of explosive forces. Eventually, between October and December 1919, U-118 was broken up and the pieces removed and sold for scrap. 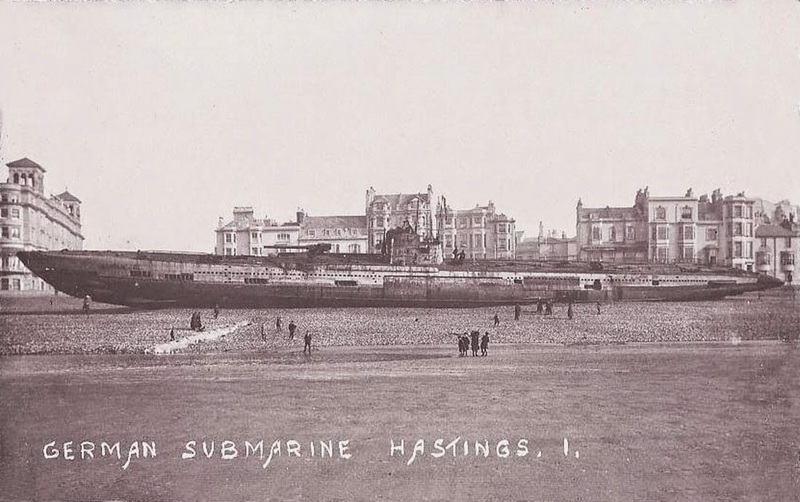 The place where this U-118 ashore on the beach at Hastings is also the place where on 26 January 1749 the Dutch VOC-ship "Amsterdam" was wrecked in a storm. That was in fact around 2 miles further down the beach at Bulverhythe. It's visible at low tide and its artifacts (including cannons) can be seen at the shipwreck museum in Hastings. I'm not sure where (in Great Britain) this occurred (haven't looked at a map, yet). My dad was born in Scotland in 1909. After my grandfather was killed in WWI, (1915) my grandmother remarried to a gentleman who was an accountant for a large "defense contractor" on Walney Island. Dad spoke of a shipwreck he would dive on, and how it most likely got there. He said the locals would hang lanterns around cows at night, and passing ships crews would think they were seeing towns and people, and set a course for it. Of course, since they were already in shallow water, they would run aground. After the crew vacated the ship and the area, the locals would loot the ship. I found it an amusing story at the least. Hastings is a seaside resort on the south coast of England roughly halfway between Dover and Brighton. Last time I went there they'd built a dual carriageway between the beach and promenade so you had to access the beach via a tunnel/subway. A dump. What happened to this U-Boat? Was it salvaged or towed back out to sea and sank? Curious. 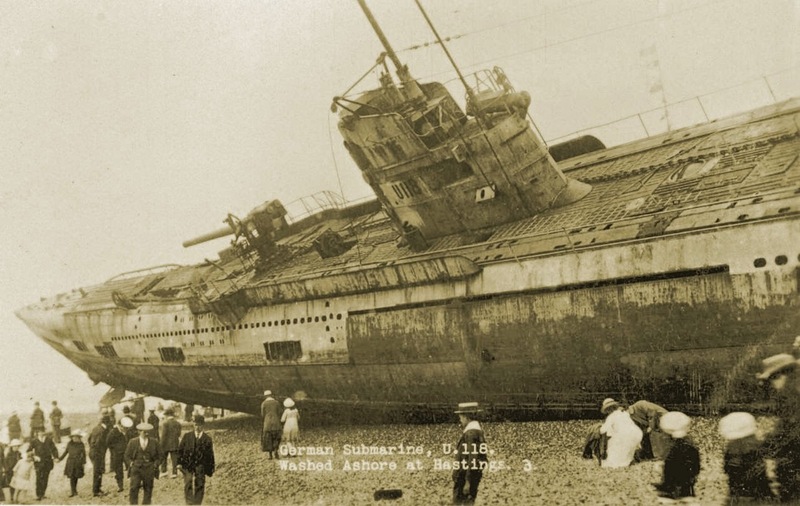 The last sentence of the article that accompanies that photo of the beached U-Boat that you are asking about states: "Eventually, between October and December 1919, U-118 was broken up and the pieces removed and sold for scrap." Tojo is incorrect. Hastings is not between Dover and Brighton. It is past Brighton and past Eastbourne on the way to Rye along the south coast. Hello Bren, The way you are describing the location of Hastings makes it clear that both you and Tojo are perfectly correct in your placement of the town on the Sussex coast. Congratulations. But please look at a map.